An Iraqi protester waves a national flag while demonstrating outside the burnt-down local government headquarters in the southern city of Basra on Sept. 7, during demonstrations over problems including poor public services. Ahmed Hussein (right) and his neighbor Kareen Khairala. Khairala is fixing a flag of Imam Hussein to the roof of his house in the al-Aleea neighborhood in Basra during the month of Muharram, when Shiite Muslims commemorate the battle of Karbala 14 centuries ago. 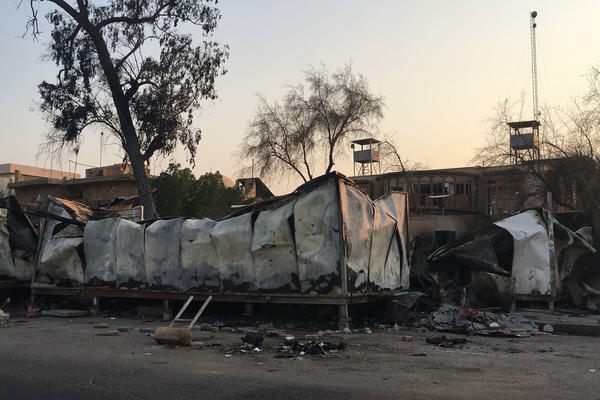 Remains of the provincial governor's guest house near Basra's corniche after being burned by anti-government protesters. A new suspension bridge across the Shatt al-Arab river was built to improve access to the border crossing with Iran. Hours after opening the bridge last year, former Gov. Majid al-Nasrawi fled the country, crossing over the new bridge into Iran, after the Iraqi government announced a corruption investigation against him. A canal along Basra's Shanashiel Street is covered in floating trash. The city was known as the Venice of the Middle East because of its beauty and canals. Decades of neglect have left it in ruins. Basra's al-Aleea neighborhood. After Saddam Hussein was toppled in 2003, tens of thousands of families occupied government land in the city and built makeshift houses. 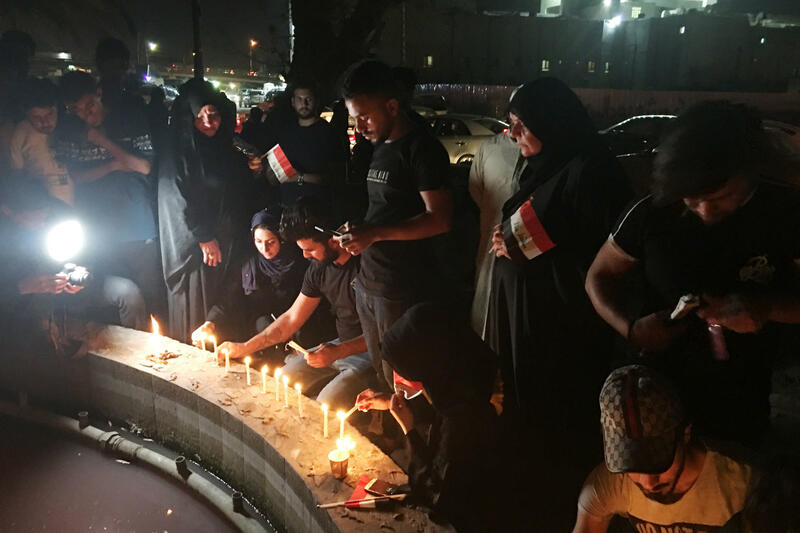 Protesters light candles in commemoration of young men killed by security forces in anti-government demonstrations in Basra in early September. As dusk falls in Iraq's port city of Basra and searing heat of day cools to under 100 degrees, the public square across the street from the city's burned provincial government building starts to fill with protesters. Young Iraqis have gathered almost every night for more than three months to protest faltering public services and lack of jobs in the city in the heart of Iraq's rich southern oil fields. In the beginning of the month, security forces trying to disperse the crowds opened fire, killing 12 civilians, according to health officials. 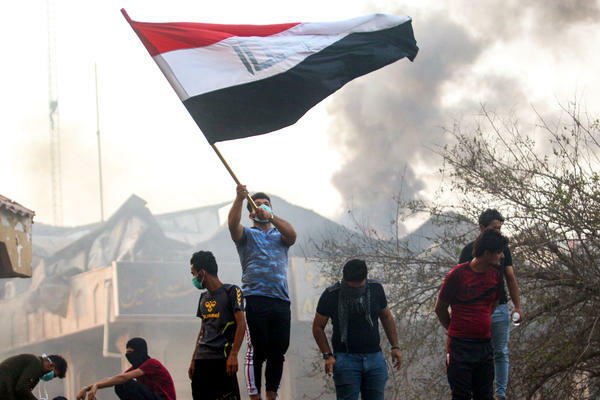 But it wasn't until protesters stormed government buildings and set fire to the Iranian consulate, on Sept. 7, that Iraqi political leaders really took note. "We have been here for months, no official has come to us or even a policeman came to us to ask us what we want," says Ahmed Hussein, 23, an unemployed father of two. He says he is afraid he could be arrested by government security forces, like dozens of other protesters, or attacked by militias, which have also been the target of demonstrations. But he has joined the protests every night anyway. "We are not looking for a fight, we are just asking for our legitimate rights," he says heatedly, waving his arms to emphasize the point. "We don't have water, we don't have electricity, we don't have anything. Aren't we Iraqi? Aren't we people of oil?" Hussein and other demonstrators say infiltrators set fire to the government buildings and Iranian consulate — not protesters, who make sure to even clean the streets after demonstrations. "We would not sabotage our country," says Hussein. Basra's acting police chief, appointed after the previous chief was relieved of duty after protesters were killed, agrees that most of the demonstrators are peaceful. "The security forces were not taking into consideration that there were infiltrators who intended to commit crimes. These criminal elements planned to provoke riots," says Gen. Rasheed Flayeh. He says he has given orders to protect the demonstrations and to arrest people planning to use weapons. But the day after the interview with NPR, dozens of protesters were arrested — some of their families unable to find out where they were being held. A few days later, some were released without being charged. Some of those arrested over the course of the protests say they were forced to sign pledges that they would not return to the demonstrations. Basra, once a diverse city with a large Sunni Muslim population, is now, like the rest of southern Iraq, almost exclusively Shiite Muslim. The demonstrations took place during the Muslim month of Muharram, when Shiites commemorate a defining event in Shiite Islam — the killing of Imam Hussein in the city of Karbala 14 centuries ago. Protesters evoked songs and slogans about Imam Hussein, the Prophet Muhammad's grandson, in the demonstrations. "Imam Hussein was a revolution and we are a revolution," chanted protesters dressed in black. They said both fought against injustice. Many in the Basra protests say they reject religious parties and political leaders they believe are tainted. "I am Muslim but all I see are dirty leaders and corrupt Islamic parties," says Durghan Zubeidi, a 20-year-old dentistry student. "I hope in the future there will be young leaders and new parties and they can change Iraq." Recent demonstrations included university professors and volunteer medical teams to support the protesters and help any wounded. Older residents at the protest said they had come out to support the young people. Abdullah Sameeh Najm, a 76-year-old retired sailor, says he has been coming to the demonstrations every Friday in solidarity with Basra's youth. "No society will advance while half its people are slaves," he says, attributing it to the thinker Karl Marx. In Najm's youth, Basra was known as the Venice of the Middle East and the Jewel of the Gulf. Tourists from what was then the undeveloped emirate of Kuwait would cross the nearby border to stroll the corniche along the Shatt al-Arab waterway or view the ornate wooden homes along the city's canals. "Look, this is the flower of Basra," Saeed Riyadh, a day laborer, says sarcastically, pointing to one of thousands of plastic bottles bobbing on sewage-infused water in a canal that runs along Shanashiel Street. A turtle struggles to surface between the floating trash, while an overturned upholstered chair floats among the debris. Basra province contains more than half of Iraq's vast proven oil reserves and its only outlet to the sea. But years of neglect and rampant corruption have left it without an effective electrical system or water treatment facilities. The power goes out several times a day, normally for an hour or more. A drop in rainfall and upstream dams in Turkey, Syria and Iran have contributed to lower water levels in Iraq's two main rivers — the Tigris and Euphrates. The water has become so saline that water treatment plants can't filter out the contaminants. Basra health officials say thousands of people have been hospitalized this summer after drinking or cooking with tap water. 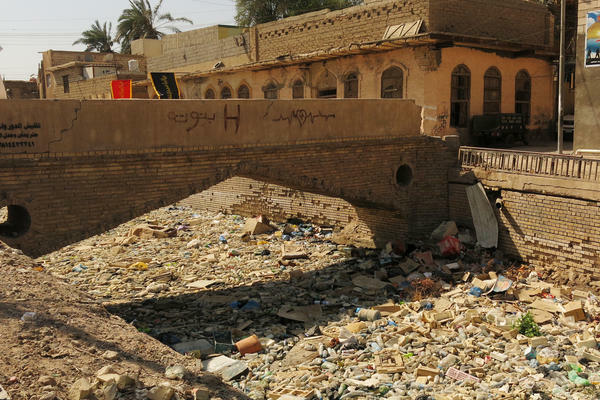 Iraq ranks as one of the world's most corrupt countries on the Corruption Perception Index. Yet even by Iraqi standards, the southern part of the country, carved up among militias, political parties and often-feuding tribes, is particularly rife with corruption. Many Basrawis refer to a shining new suspension bridge constructed across the Shatt al-Arab as "the bridge of thieves." It was built, at a cost of $70 million, to improve access to the border crossing with Iran, less than 10 miles from Basra's city center. Hours after opening the bridge last year, former Gov. Majid al-Nasrawi fled the country, crossing over the new bridge into Iran, after the Iraqi government announced a corruption investigation against him. 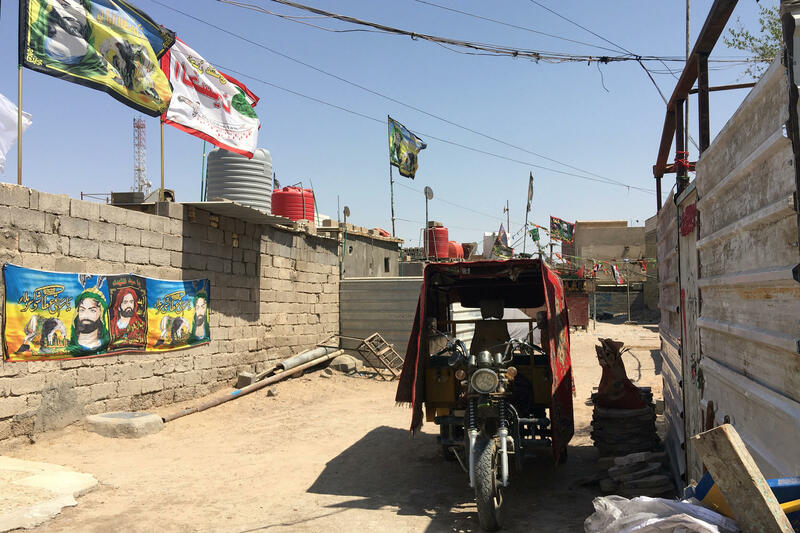 Hussein, the 23-year-old protester, lives in one of Basra's sprawling slums. The houses are cobbled together with concrete blocks and scrap metal on land occupied by families after Saddam fell in 2003. Children with scabs on their arms and legs from the contaminated water, according to health officials, dart through the dusty streets. Some are the children of special forces or paramilitary fighters among the thousands from southern Iraq killed fighting ISIS further north. Hussein has training certificates from the Majnoon oil fields near Basra but says he found only two weeks of work this year. He and others say most jobs go to relatives of political party members or are divvied up among tribes. "We have the strength to work and the energy to work and we are good people," he says. "If there is no chance for the people of Basra to work, tell us 'you don't have a chance to work' and we will leave the country." 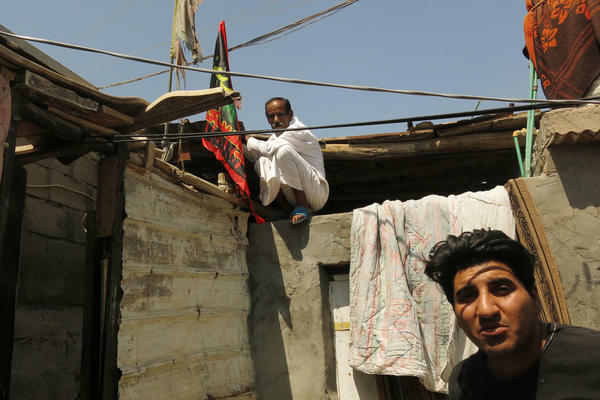 Thirteen people are crammed into Hussein's makeshift two-room house. Hussein's mother Mona Hadi says she bakes bread for neighbors, making $4 to $5 a day to support the family. His father Hussein Muhelhel lost his leg when he stepped on a land mine in the Iran-Iraq War and doesn't work. He says he received a call at 1 in the morning recently from someone he didn't know, telling him he should be careful his son isn't arrested because of his participation in the protests. Muhelhel says he doesn't try to stop him though. Ahmed Hussein and his wife are expecting a third child but he worries about how he will pay for diapers or doctors' bills. And he says he wonders whether his children will have to protest for water and electricity when they grow up. "All of the parties in the government now are corrupted. There is no exception," he says. "We used to trust them, but after years, we lost this trust." The protests also include young people who are employed but enraged at government corruption. "In the beginning people started demanding electricity and water because there was a lack of basic services, but now people know the truth," says Nasser Jabar, 25, an employee at the Basra Oil Co.
"This government is a group of militias, scavengers, murderers," he continues. "We want to change them — all of them. We are tired of their killing, we are tired of their corruption." Jabar says what he describes as a peaceful revolution could change Iraq if only people from other parts of the country would join them in the protests. 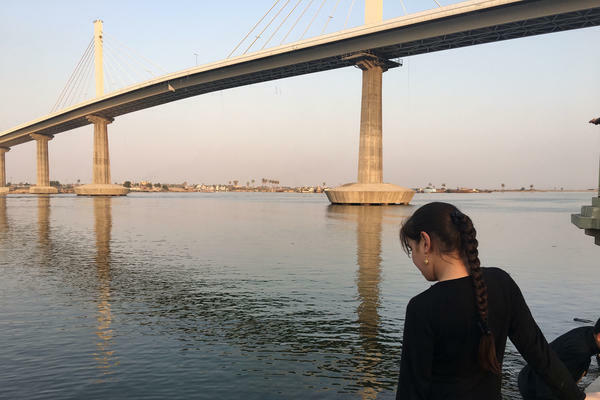 The corruption and lack of services in Basra have sparked a backlash against neighboring Iran. "Most of the people of Iraq and especially Basra know that the reason behind the destruction of Iraq economically, agriculturally and industrially is Iran," says Adnan al-Waily, 52, one of the protest organizers. Under Saddam Hussein, Iraq fought a bitter eight-year-long war with Iran in the 1980s. The front-line city of Basra bore the brunt of Iranian shelling. After Saddam was toppled, Iran became Iraq's closest ally and Shiite political leaders who sought exile there became some of Iraq's most influential politicians. "After the war with the former regime, things became normalized with the Iranians and we hugged them to our chests. But Iran is a spiteful country and they don't forget," says al-Waily. On another evening, protesters gather again at the square near the government building in memory of those who were killed in the demonstrations. Small white candles cast pools of light against a grimy statue dedicated to the Iraqi leader who led the coup against the monarchy in 1958. Some of them march through the streets and then disperse before it gets too late. "We are afraid of militias driving over us with their cars," says Hussein.